Preview: The Boston College Eagles have been successful under Steve Addazio going 14-12 overall in his first two season. Last season the Eagles had a respectable year going 7-6 overall with a loss coming in OT against Penn State in the Pinstripe Bowl. The highlight of the 2014 for the BC program had to be their surprise 37-31 win over then ranked 9th USC. With only 9 starters back the coaching staff has their work cut out for them again in BC. The offensive side of the ball will be a work in progress for the Eagles as they bring in a new OC with a new system, a new starting QB, and an O-line that has to replace all 5 starters. The offense will likely be handed over to dual threat QB Darius Wade who’ll play behind an O-line that will be a work in progress throughout the season. The ground game should be a strength again in 2015 unless the new O-line doesn’t produce. BC returns all of their depth on the RB chart including top back Jon Hilliman, but we could see regression under a patchwork O-line. The defense will be the strength of the team this season as this unit looks to build off a successful 2014 where they were second in the nation in run defense. The front seven is the clear strength of the team especially along the line where the team returns guys like Gutapfel, Kavalec, and Wujciak. The defense also returns their top 2 tacklers with LB Daniels and safety Simmons back in the mix to lead what should be a respectable unit. Prediction: With only 9 starters back this could be the first season where we see some regression from Addazio’s team. There will be a lot of responsibility put on the shoulders of the defense given how green the offense will be early on in the year. 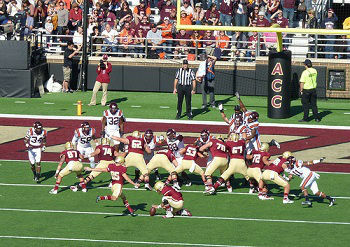 If BC gets back to bowl eligibility that has to be considered a success for this program.